I've been seeing a lot of these fair-trade made-in-Peru embroidered belts in catalogs this year. Sundance Catalog has snowflake designs; Uncommon Goods has florals. Hand-embroidered and pretty but, at $65 to $68 each, definitely out of my price range. They're really very simply constructed—a length of cotton webbing and a buckle—it's the embroidery that's making them so expensive. But hey, we know how to do that ourselves, don't we? If you want to try something like this yourself, I'd use the lighter weight webbing (the heavyweight, like I use for my key fobs, will be difficult to pass a needle through), a heavier needle with a larger eye, and a thimble to protect your fingers. Sketch your basic design with white pencil—I don't think you need to get too detailed—freeform might yield some "happy accidents". Because you want a lot of impact, use all six strands of embroidery floss or, better yet, wool—the kind used for crewel embroidery. I think you can do most of the embroidery in chain stitch (single rows or several rows packed closely together) and French knots. I'm not sure how to do the grommets but there's probably a tool for attaching them. Or you could do a D-ring type belt and you wouldn't need them at all. Some other things you could liven up with embroidery—add some flowers to a plain woolen hat or scarf or embellish a secondhand sweater with some flowers scattered across the front. I once promised to post pictures of any reader projects embroidered using stitches learned here at Stitch School. I think it's inspiring to see what others are doing and to hear about their process so I'm always happy to post pictures for show-and-tell. Amanda S. wrote yesterday to tell me about an embroidery project she just completed. She received it from her mother one Christmas with a note saying that when she was done stitching it, her mother would finish quilting it. With a big smiley face on the bottom. She probably thought it would be a while before she saw it back. And it did sit in Amanda's to-do pile for a while because she didn't know how to do most of the stitches required. Recently it made it's way to the top of the pile and she said to herself "I can do this." After stumbling across Stitch School on the internet and learning the stitches, she completed it in about a week. And took a picture (shown here) before sending it to her mother. Now it's buried in her to-do pile awaiting a rick rack border and backing fabric. Some of the stitches she used are beading (a very cool way to do blackberries! ), lazy daisy, french knots, feather stitch, and satin stitch. A big round of applause for Amanda—great job! I first became aware of Susie Ghahremani's illustration work when I was an art director—I think she may have sent a postcard in hopes that I'd find an assignment for her in the magazine I worked for. I very much regret that that didn't happen because we might have become friends sooner than we did. We met again a few years later through her online business Boy Girl Party. She's an award-winning artist from San Diego, CA whose work combines joyful imagery with highly intricate hand-painted patterns. Her love of nature, music, and textiles come together in each painting and illustration, delivered with the detail and soul of a crafter. You can read more about her at boygirlparty.com. So, why am I writing about an illustrator on a blog about needlework? Because she's going to be offering embroidery patterns based on some of her drawings, that's why. For now the very limited edition patterns are only available for purchase at her shows. And there's one coming up next weekend! Susie's agreed to take a few minutes out of her busy schedule to answer a few questions for us about the show and the patterns, some of which you'll see illustrating this post. 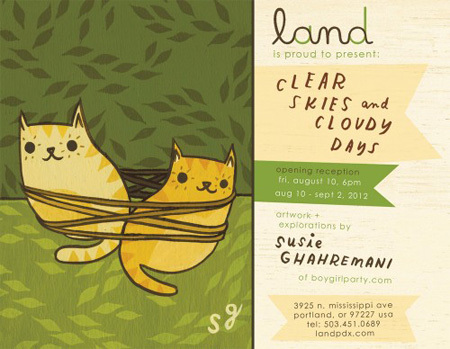 The show is titled "Clear Skies and Cloudy Days" and it runs from August 10th - September 2nd at Land Gallery in Portland, OR. It includes more than 100 of my latest works—paintings, drawings and mixed media such as cross-stitch. I'll be flying up to Portland this week for the opening reception on Friday from 6-9 pm. Land Gallery, located in the historic Mississippi neighborhood, is run by the owners of the iconic indie shopping website buyolympia.com and features new, original artwork from a fantastic stable of upcoming and established independent artists. What inspired you to do embroidery patterns (a great idea, by the way)? Thanks! 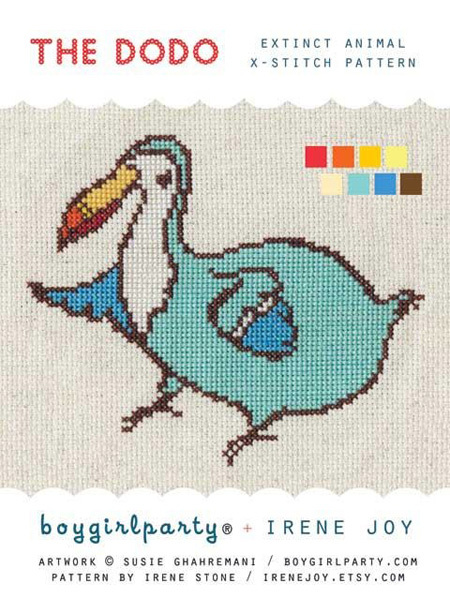 Years ago, I used to host craft nights at my house with my girlfriends, and my friend Irene Stone (http://irenejoy.etsy.com) would always bring over her cross-stitch projects (based on incredible patterns she would make herself). Watching her work on them (and being the lucky recipient of some of her handiwork! ), I thought to myself how it's a nearly extinct craft, and how I'd enjoy the irony of bringing extinct animals to life with that medium. I asked her if she'd want to collaborate on a series just for fun (my drawings, her stitching) and that's how it began! 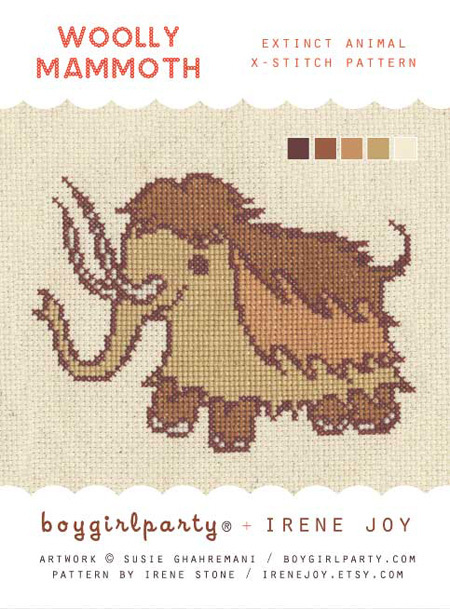 At first we only did a dodo bird, sabre toothed tiger and woolly mammoth (which are the first three patterns we're releasing) but now (two years later) we have more than 20 x-stitch-extinct animals in the works, ten of which Irene has stitched already. After we collaborated on a few of the finished pieces, we decided it would be fun to share the patterns with others so they could reach a wider audience. At the Portland show, I'll be showing all the drawings from this project and 10 of the finished cross-stitched pieces in addition to over 100 other paintings and drawings by me. And the patterns are part of a kit; what’s included in that? Basic instructions, an easy-to-follow color-based pattern printed in large format, neatly wound spools of the necessary embroidery floss, and a license for personal use of the pattern. Each sells for $14. I first saw a picture of the dodo pattern on your Facebook page (and loved it so much that I knew I had to write about it). What are the other endangered animals? The kits include just the Dodo, Sabre Toothed Tiger, and Woolly Mammoth. But the finished pieces include the Baiji Dolphin (two versions), Boobook Owl, T-Rex, Thylacine, Great Auk, and Short Faced Bear. People can pick up the EXTREMELY limited edition patterns at the show or by contacting the gallery directly; the drawings and the finished cross stitched pieces will also be for sale. I found this sweet peach-colored linen towel recently at an antique mall. 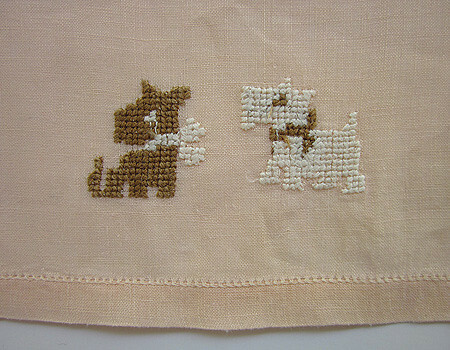 The bottom edge features two dogs (Scotties, maybe) embroidered in brown and white using very small cross stitches—almost, but not quite, petit point. You can probably figure out the design yourself—it's pretty simple—but I made it into a charted pattern for you. Click through to the Flickr page for a larger version. If you live in Pennsylvania you might want to check out a new exhibit at the Allentown Art Museum of the Lehigh Valley. Opening today and running through the end of August, the exhibit is titled "Flora and Fauna: Needlework Landscapes," and features the Embroiderer's Guild of America (EGA) America the Beautiful tapestry, a five-panel tapestry with plants, birds, and animals. Also shown will be the original Redwork Coverlet (circa 1895) as well as a reproduction sewn by the Lehigh Valley chapter of the EGA, that will be raffled off on the last day of the exhibit. Both versions feature 64 redwork blocks embellished with red feather stitching. Accompanying these main items will be needlework featuring landscape and nature themes from the museum's permanent collection, including 18th and 19th century textiles, embroidered kimonos, and Victorian era silks and towels. This is just a few hours drive for me so I'm going to try to make it there some time in the next couple of months. I'll report back! One of my readers emailed me to ask about a stitch called double stem stitch. And I checked all my embroidery books and didn't come up with anything. But many stitches are called by different names depending on where they originated and are used, so I think I may have found it but named alternate stem stitch. Feel free to correct me if I'm wrong. So, as a quick refresher, stem and outline stitches are done the same way except that stem stitch holds the thread below the needle (diagrams 1 and 2) and outline above (3). Alternate stem stitch is going to use both of these methods combined. Work along a line as for stem stitch but, instead of holding the thread below the needle for every stitch, hold it alternately below for the first stitch (ABC), above for the second (CDB), below for the third (EGF) and so on. See the first diagram (4). The second diagram (5) shows what happens when you work two rows closely together. Start the second row at "a", holding the thread above for the first stitch, below for the second, etc. Diagrams from Stitches with Variations: A Handbook of Basic Stitches by Jacqueline Enthoven. ©1976 Sunset Designs. Many thanks to Patricia in NJ (my 'personal shopper') for sending me the book! I found a very old embroidery booklet at an antique mall during the summer—Alphabets and Monograms by Anne Orr. Sixteen pages of designs, some of which have floral details like the one shown here. I've been redoing the designs into modern charts with the hope of reproducing the booklet. Not quite ready yet but I thought I'd share one of the designs with you. I'm slightly embarrassed that I haven't posted anything since April - yikes! But I've been so busy with my business this summer that I haven't had time to post. So, the free monogram chart is my way of making it up to you (click through the small chart detail above to my Flickr page where you'll find a large size chart of the entire alphabet). Enjoy! Stitch School, which used to be an occasional feature on my Primrose Design blog, now has its very own space on the web. You'll find the same tutorials, including step-by-step instructions and photographs, that you've come to love, and I'll be adding new stitches periodically. I'll also feature subjects related to hand embroidery. Freelance graphic designer, crafter, small business owner, recycler of vintage materials into accessories and home decor, reseller of vintage treasures, lover of flea markets and antique shops.